We have been busy these days covering the news from the Fly’s campaign as we have seen few good budget Smartphone coming out from this company. But this time the company has launched the tablet and this is the company’s first tablet launched in the market and it is dubbed as Fly F8s. The tablet market is one of the rapidly growing market and in this already sprawling tablet market, the manufacturer are trying to provide their best and trying to hold the tight reasonable price tag for their device. Fly is also one among the competitor and as the company is well known for its low budget device the F8s come to be one more low budget device in the company’s portfolio. This company’s first tablet is an Android tablet with voice calling feature and will be facing a stiff competition from the already established, well known of players like Micromax, HCL and more. Recently we have seen lots of tablets flowing with the Quad core processor from the Indian mobile manufacturer which include the recently successful Micromax A116 Canvas HD, Zen Ultraphone 701 HD and spice’s recent launch Stellar Pinnacle Pro Mi-535 but it will be unfair to compare the Dual core powered F8s with this Quad core powered devices though the price tag lies in the similar range . We will like to compare this device with some dual core device and hence we choose recently launched like INTEX I-BUDDY though it is pretty cheap tablet as compare to Fly F8s. 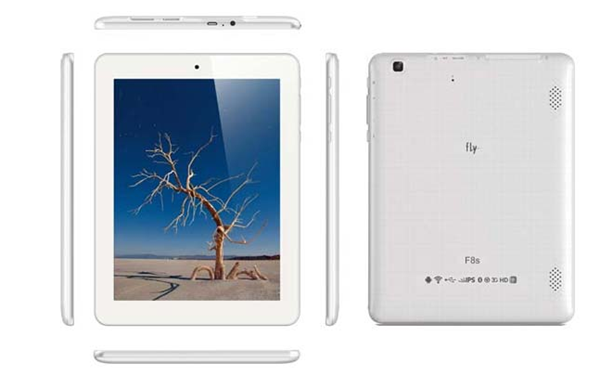 Fly F8s will be running Android 4.1 where the Intex got 4.0.4 ICS . The display is also bigger as F8s got 8 inch display and I-buddy got a 7inch capacitive display. The performance and camera also look better in case of Fly with 1.2 GHz processor with 3.2 MP rear camera and 2MP front camera where Intex got 1GHz dual-core processor with 3MP camera and 1.3 MP front camera. So if you have some good budget you can choose Fly F8s over Intex I-buddy but this device holds some down as there are various Quad Core device available on the market which can challenge better performance over F8S with the same price range. Coming toward the technical specification of the device, the company has been very particular about each specification they offer in this tablet as they know this is their first tablet. This is a not so big tablet but got the body dimension of 198 x 155 x 9.6 mm with the very good display of 8 inch Full touch XGA display with resolution of 1024 x 768 which is quiet good. The device runs Android Jelly Bean which is not the latest one but really appreciable for the price tag as this version is capable of providing you access over advance features and almost all the application available for the android world. The device is powered by 1.2 GHz dual core processor and will get the support of 1GB RAM which will try to ensure the smooth and lag-free performance experience to the user. Though there are few Quad core processed device are available in the market but still we are happy with the processor configuration of the device. The device is packed with 2.5GB of internal memory which is pretty odd but it will not hurt much as it will be coming with MicroSD slot with which you can expand the internal memory up to 32 GB. Coming to the camera the device is featured with 3.2MP camera to provide a good picture quality and a basic 2MP Camera to enable you to have video chatting. The phone comes with other basic support including dual speakers, 3G, GPS, Bluetooth, EDGE, Proximity and Gravity sensors and users will also be getting few Google Services and pre-installed services with the device. Above all, the most impressive thing we observed in this device is the battery powered of 4000mAh. Display Size: 8 inches Full touch XGA display with resolution of 1024 x 768. Considering the technical spec, look and features ,F8s seems to be a decent option with the price tag. But it will be unfair to say that this device bit the other competitor in the race as there are few other with better performance promising device with Quad core processor. So we will leave the selection upto you if you want to go for the local brand with Quad core processor or an European device with Dual core processor. The tablet is priced for Rs 13,499 and company has confirmed that it will be available soon for the online sell and in the retail market. Now This tablet is available less than Rs. 10000/– . Built in 2g/3g. Voice calling, 3.2 mp camera, dual core & 1gb Ram. Presently no tab available with this specification at this price. All Quad core are dongle (no sim) supported tablet.